Baseball season is almost halfway over and my favorite team, the Cincinnati Reds, are currently in first place in the National League Central, two games ahead of the Pirates and Cardinals. It’s been a while since the Reds were in command of anything. It should feel good. I should be excited. But I’m not. I’m not mad, either. All the steroid talk has left me with a strange sense of ambivalence. Barry Bonds was obvious. Everyone knew about him. But Roger Clemmens? Mark McGuire? Rafael Palmeiro? These were supposed to be the good guys. These were the people who allegedly saved baseball after the dark years of the strike. Something went wrong. I’ve been through this before. On the evening of September 11, 1985, I sat on the floor of my parent’s living room, listening to Marty Brenneman and Joe Nuxhall call the Reds’ night game against the Padres. We had the television on but as any good Reds fan knows, listening to Marty and Joe was the epitome of the baseball experience. Television comes in at a distance second. He came up in the first inning, and the packed stadium fell into silence. He kicked the dirt twice, as was his custom, and then transferred the bat from right shoulder to left as he gave the pitcher a mean glare. Then he shrunk and hunched into the familiar crouch that had terrified National League pitchers for almost a quarter century. 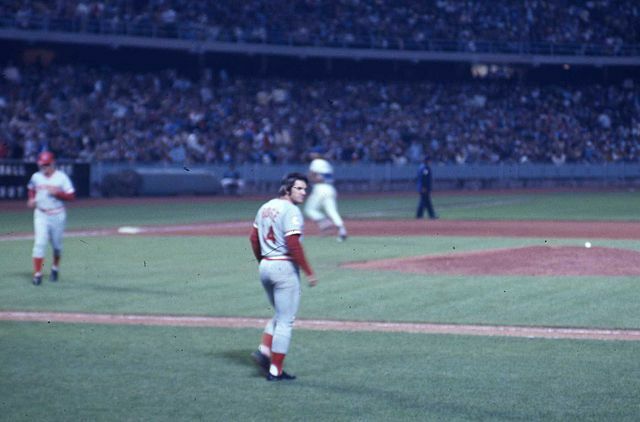 Pete Rose, Cincinnati’s version of Roy Hobbs, was in his element and there was no stopping him. You could feel the tension, even in my living room. The city held its breath in expectation. It was the same in every home within a 100 mile radius; perhaps in the whole world. At least, that’s how it felt. Eric Show, the Padres pitcher, ran the signs with his battery mate. An aging Steve Garvey pounded his glove, offering encouragement from First. Tony Gwynn, himself a scientist of hitting, took several steps towards the warning tack in Left, showing respect for the awesome power of the moment. Something was about to happen. Everybody knew it. His strategy confirmed, Eric Show straightened and went into his windup. The crowd tightened in anticipation as the flashes from fifty thousand cameras flooded the stadium. We watched in awe as the pitch hurtled towards home and Pete Rose, with his keen old eyes focused on the target, stepped into the pitch and swung. The crowd roared. They danced and shook. Fireworks lit the night sky, and Marty came over the radio briefly to certify the moment: “Hit number forty one ninety two! A line drive single into Left center field, a clean base hit, and it is pandemonium here at Riverfront Stadium.” Marty then let the crowd speak for itself. And they did, bringing the game to a halt as they showered their hero with mad cheers for nearly a half hour. Four Thousand. One Hundred. Ninety Two. That was the new record for career hits in baseball and many people believe it will remain unbroken. Three thousand hits in a career pretty much guarantees a ticket to the Hall of Fame and many famous players, including Babe Ruth, Ted Williams, Mickey Mantle, and Frank Robinson, didn’t get that far. The active leader in hits is Derek Jeter. He’s 38 and, given his recent decline, isn’t likely to hit 200 hits in a season again, much less five more seasons. To put it another way, a player would have to average slightly over 200 hits every year for 21 years to beat Pete Rose, who ended at 4256. As of today, with the current season almost halfway over, only a handful of players are on target to eclipse the 200 hit mark. Only five players made it last year, most of whom had never done it before. It truly is an astounding record. But to the people of Cincinnati, and to a kid sitting on his parent’s living room floor, it was more than just a record. To us, baseball was summer. It was a cool drink on a hot day. It was barbecues and fireflies. It was happiness. This expression of greatness from a hometown, working class hero was icing atop the greater cake. There would be other moments, other players, and other teams. But this one. This one was ours, and it was sweet. Lord, was it sweet. Three years later, near the end of the 1988 season when Pete Rose had retired as a player and had managed the Reds to three straight second place finishes against the Los Angeles Dodgers in the National League West, there were rumors. Local gambling facilities had told stories of late night meetings and special deals involving the outcomes of certain games. Pete Rose, it seems, had been cheating. Here’s how it worked. Pete Rose never bet on the Reds to lose. When he bet, he would bet on them to win. But anybody who was anybody in the gambling community knew that he had an addiction to it, and naturally he had several large debts to unsavory people. So, occasionally, Pete would not place a bet. This was the signal that the fix was in, and more often than not, the Reds would lose on these days. In the ’88 - ’89 offseason, Pete Rose accepted a lifetime ban from major league baseball. This meant that he would no longer manage the Reds, he would never again coach or be a part of any team, and he would never be elected to the Hall of Fame. For years, Rose held out. He maintained that he had been railroaded, that despite his gambling addiction he had never bet on baseball. You could almost believe him, too. Here was a person who meant so much to so many that it would have been easy to turn a blind eye in the face of light evidence. But the case against him was too strong, and in 2004 he came clean, admitting his deeds nearly twenty years after that early September evening of Joy and Happiness. Pete Rose bet on baseball. Pete Rose destroyed its soul. In 1920, shortly after investigating the Blacksox scandal from 1919 in which the Chicago White Sox allegedly threw the World Series against, ironically, the Cincinnati Reds, Kennesaw Mountain Landis, the first Commissioner of baseball, handed out eight lifetime bans against members of the Chicago White Sox team. This ban included players who had definitely thrown the series alongside players like “Shoeless” Joe Jackson, who had taken the bribe while still performing at his usual level of excellence, and players like Buck Weaver who had refused to take money but said nothing of the deal to team management or the appropriate authorities. People have often wondered why he banned those who didn’t actively throw games. “Shoeless” Joe would have obviously been elected to the Hall of Fame had he finished his career. In fact, he stands third on the all time list for career batting average behind only Rogers Hornsby and Ty Cobb, the man whom Pete Rose eclipsed with hit number 4192. Both Hornsby and Cobb are in the Hall of Fame. Landis spoke on this very subject in the years after the scandal died down and life returned to relative normalcy. In comparison to other sports, he said, baseball was linked to the American spirit. Anybody who has seen James Earl Jones’s impassioned “People will come” speech in the movie “Field of Dreams” understands this. For the last century, baseball mirrored the soul of the nation. Landis went on to say that neither baseball nor the American spirit could suffer such an outlandish betrayal of trust. Whether you acted inappropriately, gave the appearance of impropriety, or turned a blind eye towards the actions of others didn’t matter. Each deserved equal punishment. “Baseball cannot abide such treason,” he said, and for a while it seemed that baseball had been saved. He was right, of course, and Rose’s halfhearted capitulation in 2004 is a testimony to how far we have fallen from that high standard. The depth of our squalor is only heightened by the knowledge that Bud Selig, the current Commissioner and the very same man who claims that allowing Pete Rose to return to baseball would somehow tarnish the sport’s reputation, is now defending baseball against an onslaught of investigators and reporters and fans who claim that he turned a blind eye to the steroid scandal, allowing it to go on because the increase in homeruns meant an increase in profits. And what is the result? You can see it for yourself in the empty ballfields across America. It used to be that summer saw every available field weighted down by the constant pattering of feet from children who spent every moment from dawn to dusk beating a patch from home plate to first base, and all the way back again if they were good enough or just plain lucky. And where there were no official fields, kids would make their own. They would mark out a diamond with whatever they could find: an old telephone book, a construction cone, a glove or a hat. By the end of the summer, the path between the bases was worn into the grass. After a few years, the markings became permanent and would last through the harshest of winters. It used to be that neighborhood kids fought over who got to be the local hero. They would argue for weeks over who was Barry Larkin and who was Johnny Bench. Nobody got to be Pete Rose. Nobody was good enough. They would play through wind and rain and, yes, even snow. Near riots would break out between teams who argued about the specifics of infield fly rule or whether a long drive that nicked the foul pole was fair or foul. Every one of us would have given anything to get a chance to stand in against a big league pitcher. To take a mighty swing, hit the ball a long way and show him you knew something he did not. It used to be that baseball was more than just a game. It used to be that it held the spirit and soul of America. This is no longer so. Nobody watches baseball anymore. Football, with its speed and glitz and fancy marketing, has eclipsed it as the national pastime. Soccer fields cover what used to be well-groomed diamonds, and those haphazard fields of permanence from our youth have started to grow over. So the season is coming to an end; another season that, at one time, would have been intense. To the boy who sat on his parent’s living room floor twenty years ago, the thrill of a race to the finish would have been almost too much to bear. Today, the man that boy has become hardly notices. Baseball has self-destructed into a selfish endeavor and, as such, has lots its soul. It no longer embodies the hopes and dreams of a nation. Now, it is just another sport. The boys of summer have gone. And nobody mourns their passing.